Travel altars are great for more than just travel. They are compact, portable, and easily put away, so they are also great for the magickal practitioner who needs privacy or just doesn’t have a lot of space. Maybe you live with people who are uncomfortable with the idea of you being a witch/wizard/magician. Or, you don’t have much space to set up a permanent altar. Maybe you’re a traveler and your tools must fit in a suitcase or backpack! Or, maybe you have your own space and freedom to practice how you wish, but the idea of being able to pick up a small package and take your magick anywhere just sounds like fun. I covered the lid of an Altoids tin with polymer clay. 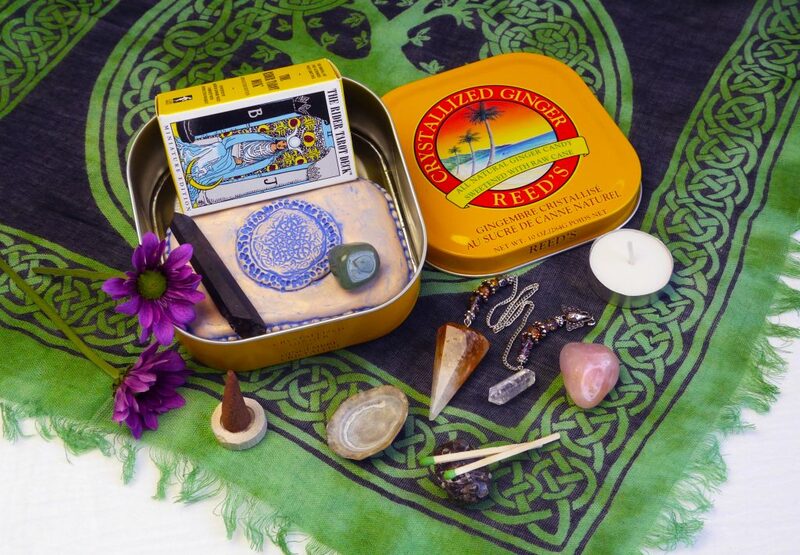 The tin has enough space for a few essential things for a small ritual, spell, or offering. A travel altar is a great idea for anyone. You can set up a travel altar for any kind of purpose. You can use whatever kind of carrying case you like, too! Several years ago, I was inspired by a picture of a tiny travel altar someone made out of an Altoids tin. I thought, “that’s a brilliant idea!” DIY mini altars are awesome because you can make them however you want, and they’re a lot of fun to put together. Some things to include in them: tea light candles , incense matches , packets of salt, seashells, matches, mini wand or athame, quarter markers , altar cloths, or deity pictures. I love to travel, and when my husband and I travel, we usually focus our trips on being outdoors. 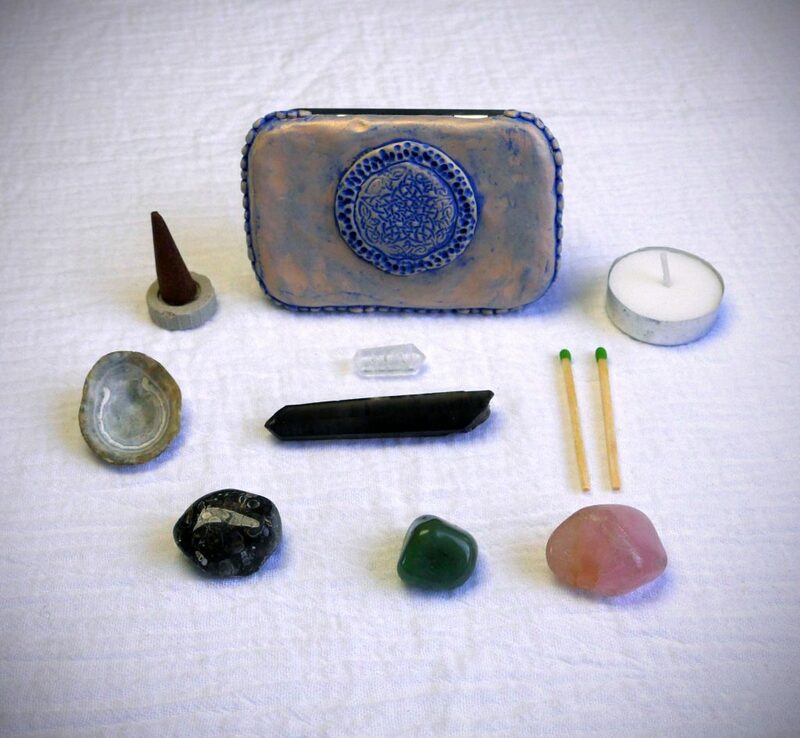 Being able to put a little altar in my day pack so I can take some time to connect with the area and practice some meditation is awesome! I wanted to bring my deities with me, so they could be part of the fun too, so I created my own Altoids tin altar. Here is the inside of my Deity travel altar, with Sri Sri Radha Krishna and enough supplies for a simple offering on the go. I used Sculpey clay to decorate the top. In retrospect, because the altar opens vertically and not like a box, this makes it sit a little crooked, but I don’t mind. If you make your own, consider how you want to use it. The picture of my deities, Sri Sri Radha Krishna, came from an incense package that I Mod Podged inside the lid, and then I hot-glued mini ribbon roses around them for a garland. I put my meditation mantra on the other side. This sits on my altar at home, but when I want to take it with me, I can pack it with crystals, an offering shell, some incense, a votive candle, and a little bell. This mini altar is best for deity worship. 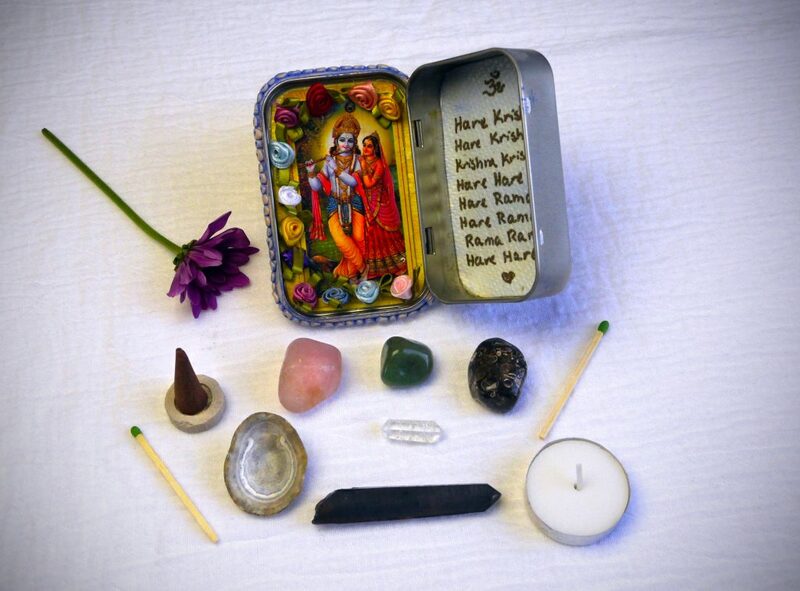 Build your own portable deity altar by using pictures of them, and filling it with items they enjoy. 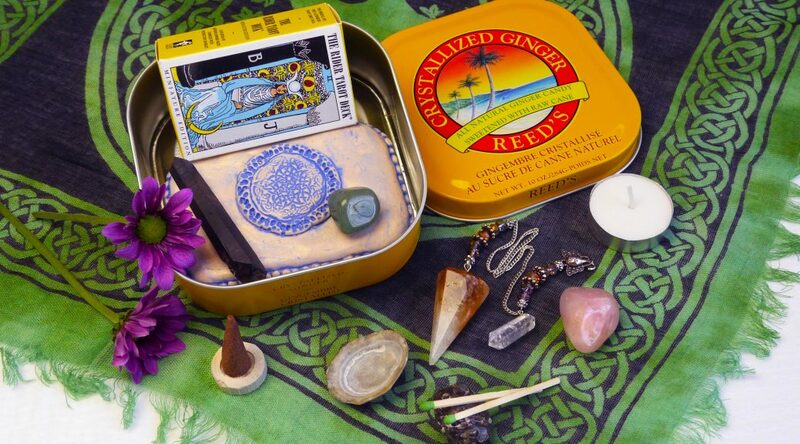 All I need for a simple spell, ritual, or divination session fits in a candy tin. I could fit a mini deck of tarot cards in here with some candles, incense, crystals, a cloth, my smokey quartz wand, and still, have space for my Deities! And it’s small enough to comfortably fit in a bag or backpack. 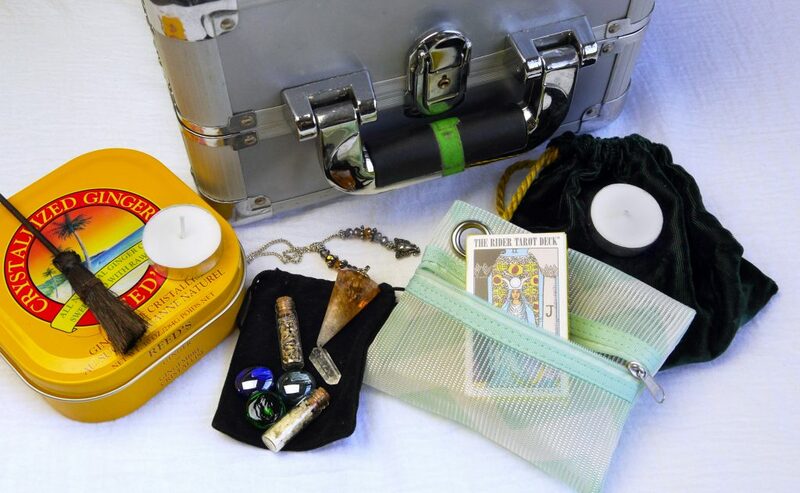 You don’t have to use a tin for your travel altar. Use a bandana or altar cloth, and tie it up with your supplies inside. A dedicated backpack or bag will work. An art or tackle box is great for having lots of little storage compartments. You could use a kid’s lunch box or a train case for cosmetics. This train case for hair stylists has all kinds of loops and compartments for bottles, wands, candles, etc. It would make a fantastic portable altar! There are lots of beautifully carved wooden boxes of all sizes. Photo and shoe storage boxes are perfect for the Broom Closet Witch who has to hide their practice for any reason. Set up your altar on top of the box. When you’re done, pack it away and the box just looks like shoes or photos. Literally, anything that suits you can be your travel altar case. These are some examples of things you could use to house a portable or travel altar. I have a beat-up cosmetics train case for those rare instances when I need a lot of stuff. Pouches and drawstring bags work just as well as candy tins, depending on what you need to bring. The small black pouch with lavender and salt vials lives in my purse, so I always have something with me for a quick emergency spell. The great thing about making your own travel altar is that you get to decide how it looks. Think about how you’ll use it and then, decide what works best. Do you want it super-witchy inside and out? Will you put sigils all over it to ward off prying eyes? Or, do you want to go Ninja-magician and make it just look like any other bag or backpack that you could wear all day without anyone suspecting you’re not really a muggle? It’s up to you! What if you don’t want to make your own, and would rather get a kit that’s ready-to-go? There are lots of amazing travel altars and witch kits that range in price from the budget-friendly to the worthwhile splurge . You will have to look around to find the kit that is right for you, but this is a good way to get an altar together quickly. Some of them are not specifically “travel altars,” but if you need a collection of tools, they’re great. And, now you know what to pack it all in to make it portable! Note: If you are traveling by plane, you will not be able to bring certain things in your carry-on. Just try explaining an athame to airport security! Keep this in mind when you’re packing. You might want a dedicated set of travel-friendly tools. If you have a witch or wizard in your life, travel altars make really nice and thoughtful gifts too. And remember, you don’t have to have everything in your travel altar. Maybe you just need a travel circle or a little Deity space like I have. You might have several little witchy go-bags for various purposes. Most of all, have fun creating your own magick-to-go! I would LOVE to hear about your travel altar! Let me know in the comments how you bring your magickal practice with you! I was at “the largest bead store in the world” Shipwreck Beads outside of Tacoma, Washington, and found they had an EXCELLENT selection of silver & pewter charms. So, I picked some up (some just for fun, some for magic)…. I got a little chalice, a little athame, a feather, an oak leaf, a dragon, and a seashell. I strung ’em on a little key-chain, and now I have the ULTIMATE in tiny travel altars! LOL Just another option for those who can afford to spend a few bucks (and, none of the charms were more than $3.00 individually) and want their altar super-tiny. what we should be prepare? I was wondering where do you find the meanings of different charms and the things for your alter? Also can you enchant any object the same way you wrote you can enchant your drink? I’ve been reading your posts nonstop since I’ve found it so I have a lot of questions at one time. And i LOVE your alter using an altoids tin!